For technical information and discussion of Buell Rider Ergonomics - Seats, Footpegs, Controls and Grips as well as their repair/maintenance/upgrades. Make sure your elbows aren't locked, keep them bent and your wrists aligned with your forearms. Don't support your weight on your hands, use your back and legs by grabbing the tank with your knees. Also, don't hold on the throttle too tight. Okay...I hate to admit it, but I have been known, late and lazy in the middle of the night, to stop at gas station and buy a "condom" formerly known as a "rubber" before they became PC. Rip the business end off and take the "ring" and stuff it between the grip and the housing. 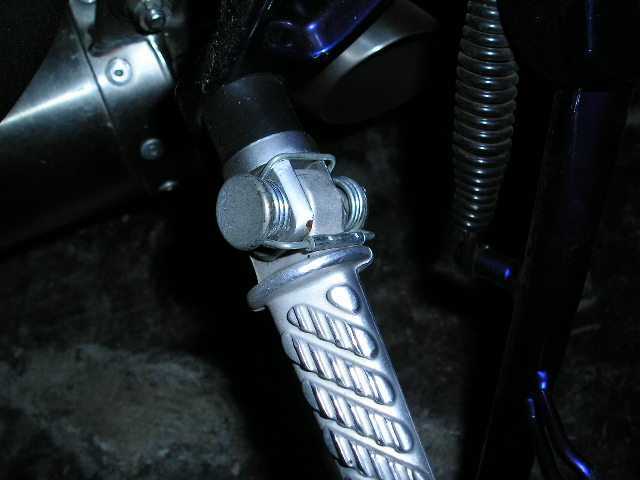 It will provide sufficient grip to hold the throttle in place, yet be easily overcome by any force you apply. Gads...did I really confess that? And..yes, a rubber band (stolen from a newspaper in a driveway) works too. But if you forget and use it when you reach your destination you are in for a world of hurt. The same thing happens to me. A friend told me about a "Throttle Rocker". It mounts on the grip. You use the heel of hand to twist the throttle. That way you don't have to hold the grip so hard. Mine has a velcro strap for easy on & off. I don't use it unless I am going to riding more than 30 min. It takes alittle getting use to. >>>I don't use it unless I am going to riding more than 30 min. Same with the rubbers...if you are not riding for at least 30 minutes, why waste the time. hey, thang, some of us are still recovering from THAT particular trauma! Not keen about the stock mirrors on my M2. Love the CRG Lane Splitter mirrors. I had the Napoleon bar end mirrors on my old bike. I liked the look but I didn't like them cause they widened my profile and it's difficult to hang a hand off to wave at the other riders. It was nice not looking at my arms and elbows all the time though. I have to dip my arms to get a decent look these days. Just completed a handlebar switch on the ole X1--installed bars off of an S3T. Here's the comparison--the standard X1 Lightning bar (we're talkin' about a tube machine now) has a total rise of 4"; the S3T has 6". Interestingly, the width of the touring bar is 1" less that the original which is fine by me. That additional 2" in bar height makes a big difference in riding comfort. Now I can ride without locked elbows. Those riders that have long torsos (those that wear TALL size shirts would be candidates) might want to look into doing this swap! If anyone's interested, I'd be glad to detail what needs to be moved, drilled and adjusted (for a clean install). I have a Dual Star mirror mounted on the bar end. Cheap, rugged, works. IMO bar end mirrors are a huge improvement. With most you have a view of at least 2 lanes behind you with no elbows obstructing your view. Does anyone know if there are some nice aftermarket bars for the XB9SX? Checked one out today and I like everything except the upright riding position, reminds me of a stock Blast. Does anyone know where I can get a shop manual and a lowering kit for a 2002 X1 White Lightning? or, perhaps, an M2Low suspension setup for the rear? 2) "STILL WANT TO LOWER FRONT END MORE" ??? FRONT FENDER will start to be TOO CLOSE !!! If you have an 02, you want the late model lowering bracket, part #6069. It pushes the front shock eye back about 1/2", which with the 2/1 lever ration on our swingarms, raises the rear wheel by about 1". Anyone know the grade of aluminum Crossroads uses for their products? 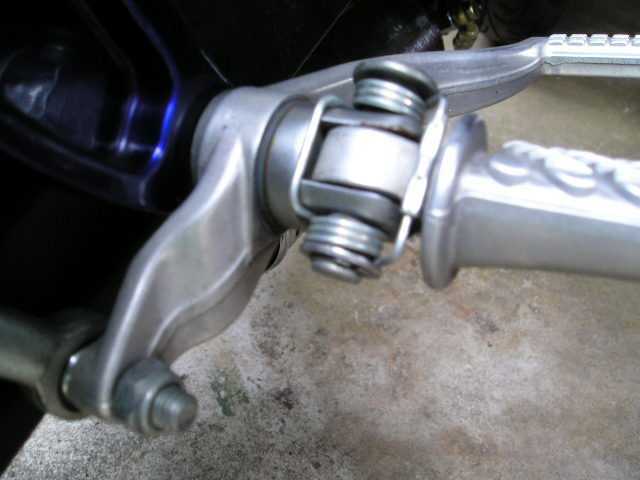 I am putting bar end mirrors on my X-1. Anyone know of something I can plug the holes with where the old mirrors where? anybody have installation instructions for them millenium foot peg springs? I remember them givin' me some milk crate time when I put 'em on my S3. An example on the bike helped me.... I'll snap a picture tomorrow if you need it still. Are those aluminum foot pegs in the photo above the millenium foot pegs? And will they fit on an M2? I really prefer metal foot pegs over rubber, must be a hangover from dirt bikes. Any major drawbacks? Like more vibration? Another question, I went to gel grips, they helped but would like something a little larger (even if only in the center) and softer because of my carpel tunnel problems, does anyone have brand name for something like that? Yes those are the pegs & associated hardware specified up at the top of this page. They'll fit nicely on your M2. I do't recall noticing an increase in vibes. They're made for dirt bikes, and on my SV and the S3, I had to cut the inner most grip "donut" off with a utility knife to have enough room on the throttle barrel. No biggie. The material is kinda sticky, but some rubbing alcohol on the bar as well as inside the grip makes it easier to slip the grips on. I then secure the grips using safety wire - the grip has 3 grooves for exactly that purpose. Got those added to my things to find/next order list. I'm working on getting my carpel tunnel problems taken care of, getting the bike was an incentive to do it. thanks for the photos dave! i've looked at them on a bike before but it'll be a heck of a lot easier bringing the pics out to the garage! jack i have those pegs on my m2 now, they rock! Grand Touring grips form Dennis Kirk -- a more pronounced barrel shape (that is, more diamatet in the center) than the progrips, but not gel . . .
aha! it appears i need the footpeg pivot pin! the regular old bolts won't allow for the springs it seems! My M2 has the springs and pins with eternal snap rings (not e-clips) now, so it looks like all that will work with the foot rests. I'm going to try to get those ordered up tomorrow. Got the Grand Touring grips ordered today, thanks for the lead on those Bomber. my pleasure, Jack -- I love em! I've got a 1997 S3T and I'm sick of the high bars. Does anyone know what other type or style of bar will work without hitting any bodywork? How much less of a rise do the regular S3 (non touring model) bars have? I've got long, ape-like arms. I realize that all 7/8" bars will fit the clamps and controls, but I want to save the expense of experimentation and fairing/tank impact. Thanks!! Got my Grand Touring grips installed on Saturday and my Back Off module installed. I love the flashing brake light (...- like "V" for victory in Morse Code). Celebrated with a toodle around Mt. Desert Island on Sunday and the grips feel great. Between the extra size and my CrampBuster no sleepy throttle hand.